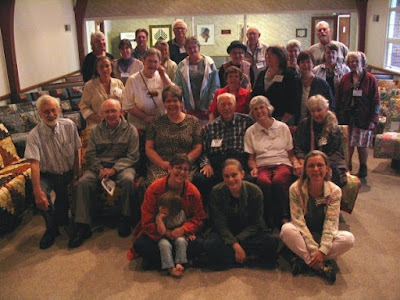 One of my favorite bloggers is Peggy Senger Parsons; a Quaker pastor in Salem, Oregon. Her blog is entitled A Silly Poor Gospel. She has recently published a book of essays entitled So There I Was.... Click here to read one of her recent blog posts which is also a chapter in her book. It's good stuff. Sunday we did "quilt blessing" at North Seattle Friends Church. NSFC has a ministry called Stone Soup Quilting which makes quilts and gives them anonymously to patients at the Fred Hutchinson Cancer Research Center. 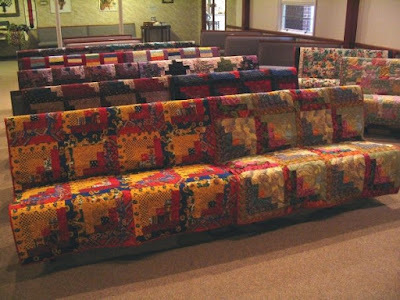 Before the quilts are delivered they are laid out in the sanctuary and blessed by the entire congregation. I recently put together a teaching about women in ministry, entitled "1 Timothy 2:11-15 and 1 Corinthians 14:33-40 revisited." You can read it HERE. I watched a terrific but sobering PBS/Frontline documentary last night entitled "Ten Trillion and Counting". It originally aired in March of '09, so is quite recent. The documentary explores our mounting national debt and the politics behind it. The United States is borrowing money like mad just to function and, sooner or later, it's got to end--which will mean much higher taxes, cutting services to the bone or financial catastrophe.